Brammo may have chosen to wait out the 2012 season and instead focus on the business of building and selling electric motorcycles. For example, Mission Motors obviously has a top end bike but have repeatedly said that racing isn't their goal, selling motorcycles isn't their goal, instead whatever race participation they do has the goal of a bit of R&D and a bit of attention getting. 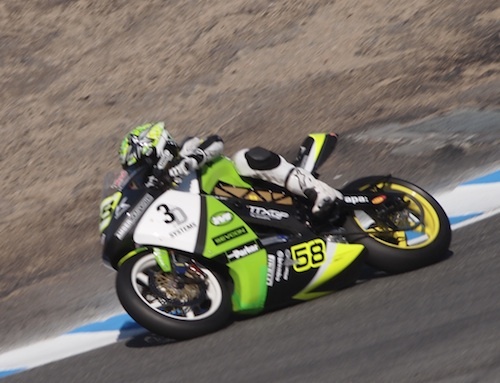 On the other hand Lightning Motors has a huge focus on racing, with a longer term goal of selling a line of electric motorcycles riding on the cachet of being the top electric motorcycle race team. Brammo's goals seem to be somewhere in the middle in that they're committed to selling a line of electric motorcycles, and at the same time are interested in racing and the R&D that occurs on the track. Over on the TTXGP Matters blog, Richard says someone told him Brammo would be back with a motor that's twice as powerful as last years. (see http://ttxgpmatters.wordpress.com/2012/02/15/brammo-is-all-in-for-2012-ttxgp-lightning-has-a-dance-partner/) They should also finally be coming to the track with a bike that has the 6-speed transmission built in (the 2011 bike did not have the transmission). As Richard says, the 2011 Brammo bike had the range, had the rider, had the suspension and handling, but did not have the oomph to beat Lightning or MotoCzysz. Thanks for the mention! Brian Wismann told me himself at Miller last year that the '12 bike will have about twice the power, and that they even already had the motor but chose not to risk the National championship. The difference is that the street bike will be a "low" voltage motor (about 100v), where the race bike uses and will use a high voltage motor. Not sure that when you run close to the 400v range, you need a transmission because of the rpm range the voltage allows. No, I don't have any specific info. It just seems logical, that they're planning to sell the Empulse/etc later in the year with a 6-speed transmission, and that they would race with an Empulse RR that has a 6-speed transmission to race-test it and perhaps prove why they chose the transmission route. I wouldn't think they would need a six speed transmission...the reason for five and six speeds is to keep a ICE engine in its best RPM band...making max horsepower. An electric motor has its "max horsepower" in the battery pack and it is virtually flat. An EV produces near 100% torque all the time. The motor does not "make" power, as a ICE engine does. I could see maybe a two or three speed to maintain a flywheel effect, keeping the motor speed high... but I bet six speeds will prove no significant gain. In personal conversations with Dennis Berube, World Champion electric dragster driver going from zero to +160 in the seven second range, he stated that at first he tried transmissions, but found his "Current Eliminator" to be faster without the added weight of a transmission. It has been a controversial move and to my knowledge Brammo hasn't fully explained themselves. With all due respect to Dennis Berube, road racing and for that matter typical driving around town is different than a drag race. On the road you're speeding up, slowing down, repeat over and over, whereas a drag race is one burst of speed. Brammo for better or for worse chose sometime in late 2010 to go with a 6-speed transmission. This meant delaying release of the Empulse and now Engage/Encite motorcycles so they could integrate and productize the transmission. They're smart people so they must have some good reasons for doing this. My guess is they want to keep the motor in the sweet spot of high efficiency more often. The power charts I've looked at (not that I look at many) show the peak efficiency is only in certain RPM/power ranges.